FORT WORTH, Texas--(BUSINESS WIRE)-- Three in ten singles look up a potential partner’s career information to determine average salary prior to pursuing a relationship, according to the latest study from Elevate’s Center for the New Middle Class (CNMC). The study, which surveys single Americans with prime and non-prime credit (scores below 700), seeks to understand how credit and financial wellness impact dating. This year’s study is an expansion on a similar study conducted last year, which surveyed couples. 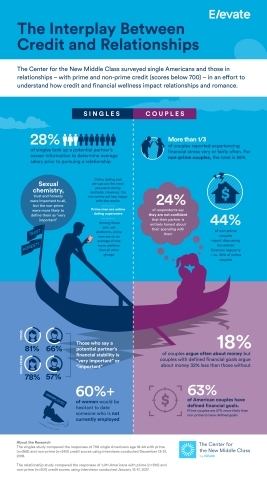 According to the study, online dating platforms and tools are the top methods for meeting new dating prospects. The survey also broke respondents up by credit score into self-reporting prime and non-prime categories – and found that prime single men were online dating “power users”: Among American singles that use online dating platforms, prime men were on average, on one more dating platform than other cohorts. As some of these platforms are paid, prime men’s financial stability and ability to invest in their romantic search may improve their chances of finding a compatible mate. That might explain then why non-prime men and women are much less satisfied with online dating and set-ups than prime men and women. Credit status has no bearing when it comes to the top five most important factors in determining compatibility: trust, honesty, communication, compatibility, and sexual chemistry. Interestingly, non-prime singles are more likely to emphasize the importance of sexual chemistry: about 9 in 10 non-prime singles say it’s “very important” or “important,” compared to 8 in 10 prime singles. More than 50% of American singles regardless of credit discuss finances in the first 3 months of dating. Prime singles value a partner’s financial stability more than non-prime, and women value stability more than men. Regardless of credit, more than 60% of women say they’d be hesitant to date someone who is not currently employed. Last year’s couple-focused study found that couples are by no means immune to financial stress: More than a third of those surveyed reported experiencing financial stress very or fairly often. But both studies hint at a correlation between one’s credit score and the success of his or her dating or relationship experience. The Center’s research compared the responses of 708 single Americans age 18-44 with prime (n=368) and non-prime (n=340) credit scores using interviews conducted December 13-31, 2018. For more details on the study, click here.